With the new CatEye Fit, you can take your workout anywhere you go with all the cycling functions and features you’ve come to expect from CatEye plus the addition of a 3-D pedometer. Simply remove the CatEye Fit from your bike, throw it in your pocket or bag and away you go. The built-in 3-D sensors automatically track your steps once it’s removed from the bike, so there’s no need to strap it to your hip or waist. 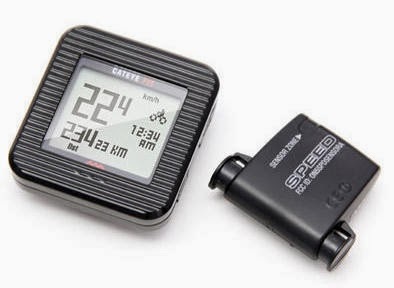 It tracks in real time current/average/max speed, elapsed time, distance and calories in Bike Mode and tracks steps, elapsed time, distance and calories in Walk Mode. The CatEye Fit is easy to use with auto data save and reset each day, and a large, easy to read screen. Now in stock in all three Century Cycles stores!